Scarborough Sunday League leaders Traf powered to an 11-1 win against previously unbeaten Ayton. Mikey Barker hammered in five goals for Traf, Liam Vasey notching a brace, with Luke Jones, Jamie Patterson, Alex Sheader and Curtis Rose also on target. Josh Young was the star man for Traf at right-back. Ryan Baldry scored the consolation for Ayton and was also named as their man of the match. Angel also continued their 100% start to the season with a convincing 6-0 home win against Fylingdales, striker Isaac Sands netting a perfect hat-trick. Sands opened the scoring for Angel with a glanced header from a cross by debutant Cam Dobson, who then slammed home his first goal for the club to double their lead. A 20-yard powerful drive from central midfielder Chris Nelson made it 3-0 to Angel and they added a fourth with a fine header from Gaz Thomas from Martin Cooper's precise corner. After the break Angel were playing into a strong wind and found it harder, but there was still time for Sands to round the keeper for his second with his right and complete his perfect hat-trick with a low left-footed shot from the edge of the box. Sands was named as man of the match but Nelson also deserves credit for a strong performance in the heart of the Angel midfield. Roscoes Bar claimed a 3-0 win at West Pier, who have former boss Paddy Parke back in charge. Bar had key players missing, and Pier started strongly, but it was the visitors who took the lead through Mark Kenyon, scrambling the ball over the line after winning a 50/50 with the Pier keeper. Ten minutes later it was 2-0 Graeme Farrah's shot from outside the box evading the keeper and flying into the bottom corner. Bar improved after the interval and sealed the win with a long-range shot from the experienced Andy Noon. The latter shared the man of the match award with fellow scorer Kenyon. Hush claimed a fine 3-2 home win against Newlands Reserves to remain top of Division Two. The home side opened the scoring through Ryan Collings, who raced onto a ball over the top and finished neatly after a one-on-one with the Newlands keeper. Mikey Anderson levelled for Newlands, only for Hush to restore their lead through a second Collings effort before half-time, a tap-in at the back post. Rich Tolliday equalised again for Newlands but 10 minutes from time Ben Sheader - brother of boss Dan - popped up at the far post to secure all three points. Dan Sheader said after the game: "That victory was all the sweeter for us as we were missing a few players, and also we were based at Newlands last season. 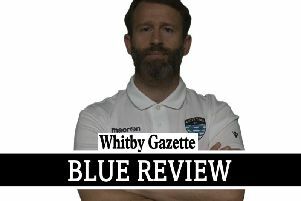 "Dean Andrews played well for us as did Collings with James Burrows having a superb match in goal , pulling off some superb saves in the first half, but the whole team were outstanding." Veteran Dave Wedge and Anderson shared the man of the match award for Newlands' second string, who put in a battling performance in this keenly-contested encounter. Valley striker Sam Westmoreland smashed in four first-half goals as his side returned to winning ways with a 6-1 home success against Radio Scarborough. Man of the match Westmoreland, who has now netted 12 in four games this season, scored twice before an own goal gave the visitors hope. But this hope was soon quashed by another two strikes from the Valley striker, further second-half goals from Josh Welburn and Paul Nuttall. Ayton Reserves earned a 4-1 win at Fylingdales Reserves, a first win of the season in the league for Steven Frederiksen's troops. Luke Chambers' scuffed shot in the first minute was forced into his own net by a Dales defender to hand Ayton the ideal start, then a few minutes later it was 2-0 when Chambers' fine cros was converted by Richard Howes. Fylingdales' man of the match Taylor Humble replied with a goal on the half-hour mark, with Ayton's Si Coupland having an effort disallowed just before the break. Chrissy Hannam restored Ayton's lead after the interval, forcing the ball home after a free-kick from Ste Molloy, then sub Aaron Aghajanian scored when he was quickest to react a rebound from his own shot. Centre-backs Molloy and Aaron Armstrong shared the man of the match award for Ayton. Kurt Williamson banged in four goals as Angel Athletic Reserves strolled to a 9-0 win at Golden Last. Also on target for Angel were Ste Whitaker, Ryan Somers, Luke Jenkinson, Dominic Barber and Macauley Youngson, Jenkinson's 18-yard strike the pick of the bunch. John Martin was man of the match for Golden Last.